Since our establishment in 1837, Flagmakers have been producing the highest-quality national flags and standards throughout the United Kingdom. However, the St George’s Cross has existed well before then, dating back to the end of the Third Crusade around 1192 AD. Originally associated with others before St George, the red cross on white background was historically an emblem of the Knights Templar during the Second Crusade (1145–1149). It was only until after the end of the Third Crusade, did the emblem become recognised as the Cross of St George, the “warrior saint”. 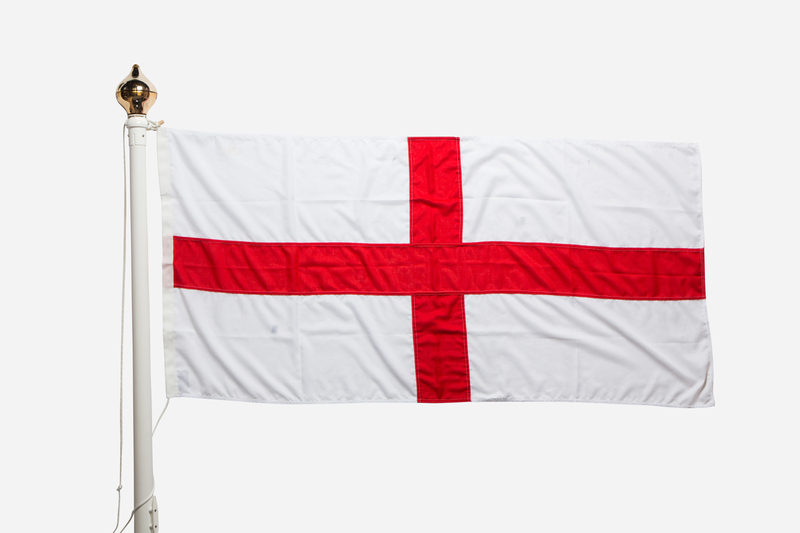 The England Flag (or St George’s Cross flag) is manufactured at our Chesham-based factory and made with high-quality 155gsm woven cloth, stitched with a double-sewn hem. Our St George flags have adorned the insides and outsides of many prestigious buildings in the UK, and the quality of the flag reflects its status. Each flag comes with a headband, rope, and toggle, allowing you to fly the flag from any standard flagpole. We have received the flags today and are really pleased with them. Many thanks for all your help and hard work! The English flag has no official status within the United Kingdom. By 1300, there was also a greater “banner of St George”, but not yet in a prominent function; the king used it among several banners of saints alongside the royal banner. Saint George had become popular as a “warrior saint” during the crusades and Edward III, who in thanks for Saint George’s supposed intervention in his favour at the Battle of Crécy gave him a special position as a patron saint of the Order of the Garter in 1348 and from that time, his banner was used with increasing prominence alongside the Royal Banner and became a fixed element in the hoist of the Royal Standard. St. George finally rose to the position of the primary patron saint of England during the English Reformation when all religious flags, including all saints’ banners except for his were abolished. Under the stewardship of King James, in 1606 it was combined with the Scottish St. Andrew’s Cross to form the Union Jack. Since then the terms Britain and England were used largely interchangeably and the Union Flag was used as England’s national flag even though it has never been officially adopted as such. The White Ensign, at one time called the St George’s Ensign due to the simultaneous existence of a cross-less version of the flag, is an ensign flown on British Royal Navy ships and shore establishments. It consists of a red St George’s Cross on a white field with the Union Flag in the upper canton. English naval ensigns were first used during the late 15th century and the first was striped in green and white (the Tudor colours) but as the monarchy changed other colours and styles were introduced until 1800 when the current design was introduced. The flag of the City of London is based on the English flag. It has a centred St George’s Cross on a white background with a red sword in the top left quarter which is also known as the upper hoist canton. Legend has it that the sword represents the sword that beheaded Saint Paul who is the patron saint of the city.